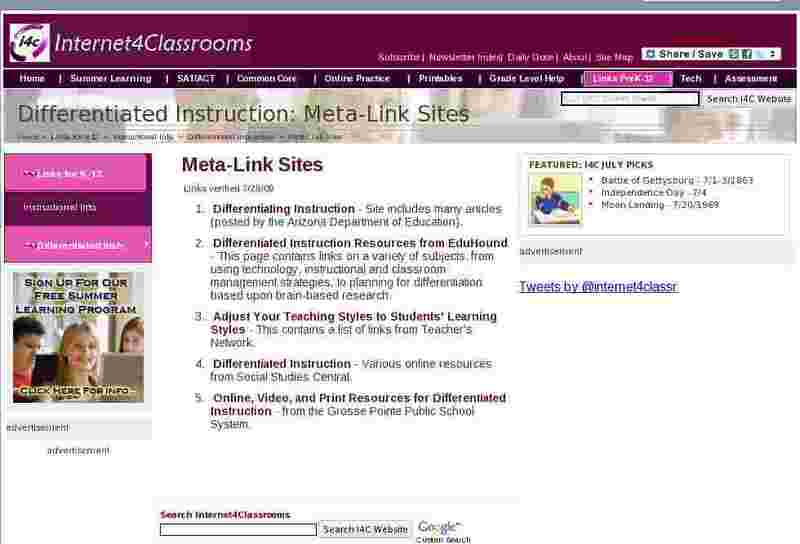 Differentiating Instruction - Site includes many articles (posted by the Arizona Department of Education). Differentiated Instruction Resources from EduHound - This page contains links on a variety of subjects, from using technology, instructional and classroom management strategies, to planning for differentiation based upon brain-based research. Adjust Your Teaching Styles to Students' Learning Styles - This contains a list of links from Teacher's Network. Differentiated Instruction - Various online resources from Social Studies Central. Online, Video, and Print Resources for Differentiated Instruction - from the Grosse Pointe Public School System.